The picture to the left is of my nifty new dry erase wall in my art therapy studio. Although I do not use this blog to promote products, this new Sketch Pad paint by Sherwin Williams is worth noting. 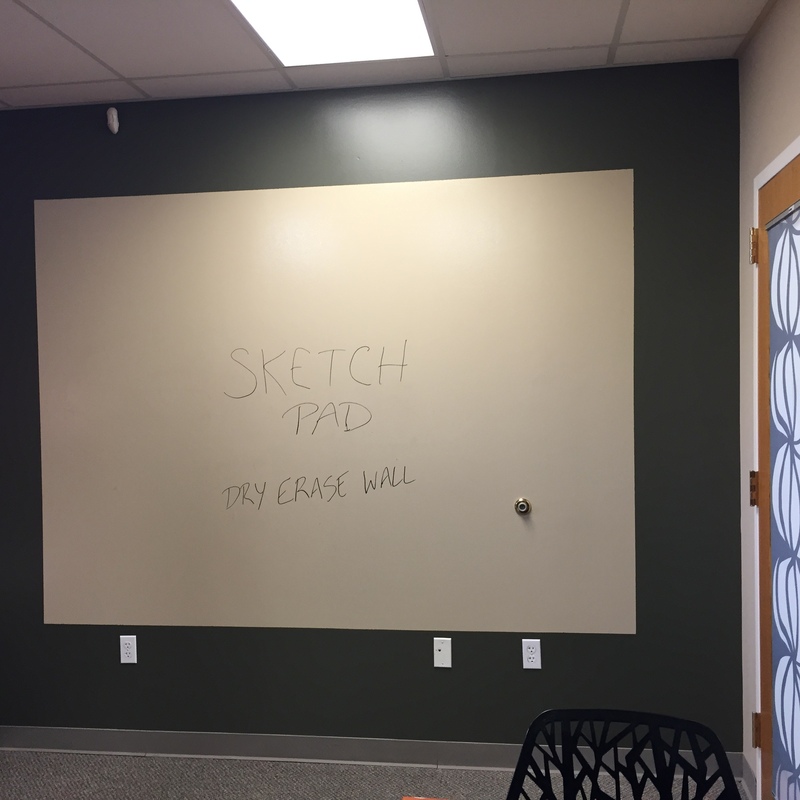 It is a clear dry erase paint that you can cover any wall with, allowing for giant writing/drawing areas I painted the dark green border with a washable semi gloss paint to give the dry erase area a nice boundary. Having worked as a therapist for years in places with tiny dry erase boards, I decided to expand the potential of my clients’ self-expression, without subjecting them to the dust and sound of chalk and a chalk wall. My goal is for clients to take a photo of the work we do/things they write in place of the papers they take along at the end of their sessions. This new giant writing/drawing space is a perfect metaphor for how people often limit their potential by dreaming small. After years of working in the trenches of the mental health field, one consistent theme I have observed is people setting flimsy goals that are reachable, but don’t really involve risk taking (risking well), or even taking risks in just contemplating future ideas. The culprits in many of my clients’ lives sadly are often well-meaning teachers or family members who planted lifelong debilitating ideas in people’s heads limiting their value or worth, based on their own limited views of themselves. On occasion, this self-fulfilling prophecy of mediocrity is transmitted through several generations. What would it cost to dream bigger than you usually do when thinking about short-term or long-term goals? The first answer I usually hear is that thinking bigger is too time consuming, and the stressful day-to-day issues must take precedence. The secret is that if we expand the boundaries of our dreams/goals/plans/future, then getting halfway to that expanded place means you will probably accomplish the initial stuff you hoped to do. Can you find some paper and start jotting down some dreams/goals plans? Can you get out of your comfort zone and try to write down ones that might sound outrageous or unreachable? A good benchmark for recognizing that you are out of your comfort zone is the sensation that someone might see what you are writing. Feel free to rip up the evidence following this exercise, but can you push yourself even further and share your new and expanded dreams with someone you trust? That is the recipe for dreaming bigger!